My friend Emma, at My Creative Time, did a couple of projects using balsa wood this week, which reminded me that I should pull mine out again! I thought it would be fun to make a tag today. 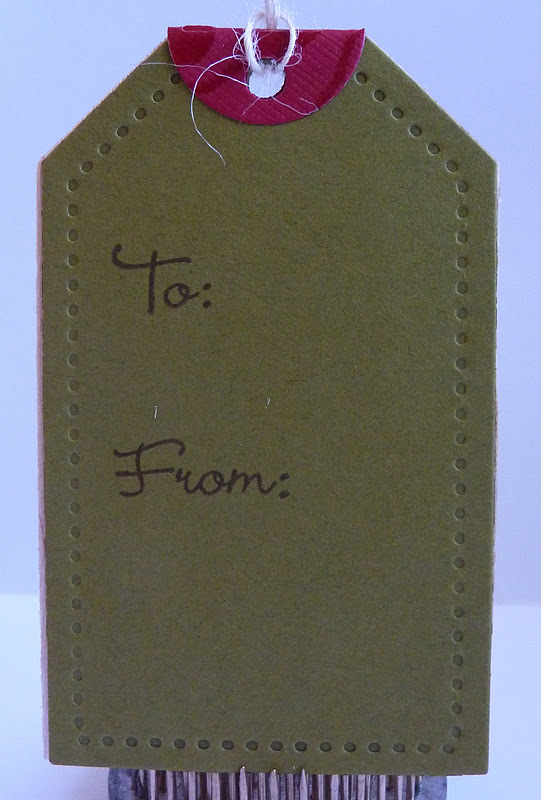 I cut my balsa wood tag shape with the Papertrey Ink Tag Sale #3 die. Then I used a scrap of red patterned paper to cut the coordinating circle that wraps over the top of the tag. The pine bough and sentiment are from PTI's Love Lives Here: Holiday stamp set. 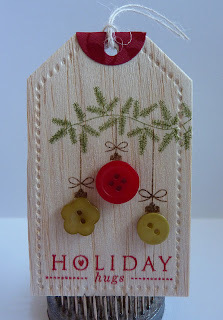 I love my PTI Holiday Button Bits stamp set, so I pulled it out to stamp the ornament hangers. 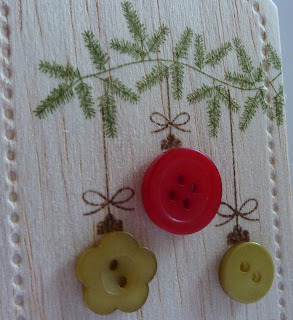 I then added some cute vintage buttons. 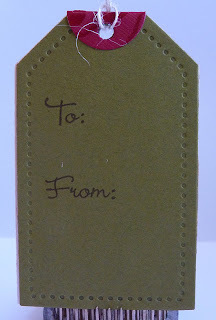 To make the tag sturdier (balsa wood is pretty flexible) and to add a place to write, I cut the same tag again out of green cardstock and adhered it to the back. The "To" and "From" are stamped from My Creative Time's Gift Card Sentiments stamp set. Don't forget, you can also use your Cricut Imagine to print on balsa wood. You can see how in this video. Okay this is so cute. I am really lovin' that balsa wood. Where do you buy it? 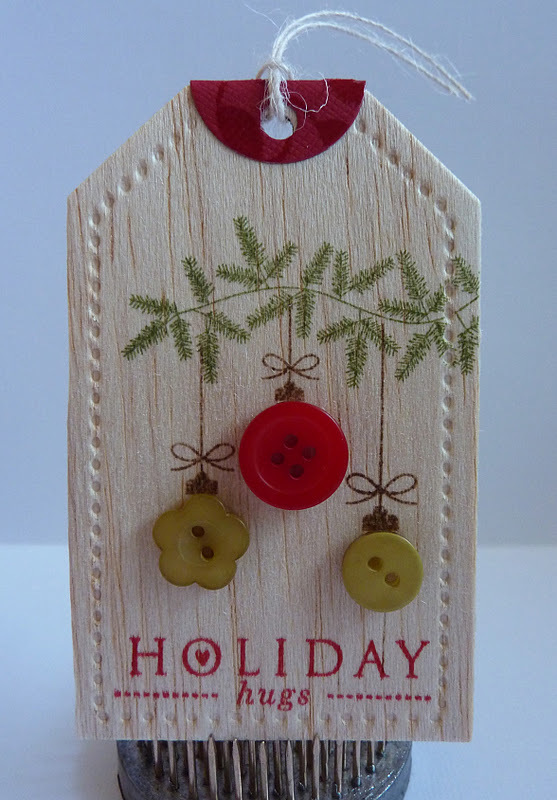 Katie what a lovely tag going to look amazing on your Christmas packages! SOOO COOL! ohh I want to try this! This tag is so cool. I love the idea of using balsa wood. I'm going to have to get a couple of Emma's dies so that I can give it a try. Thanks for sharing. Very pretty tag! I would love to experiment with balsa wood, what a great way to add dimension to a project. K, I am SO going to find balsa wood tomorrow! This is totally gorgeous!!! Oh my gosh Katie! That is so pretty! Love it! I LOVE IT. I WILL BE LOOKING FOR SOME BALSA WOOD AT MY CRAFT STORE!!!! Great tag. I love the button idea. I just loveeeeeeee this cartridge. Too darn cute!! Thanks for soooooo many great holiday ideas!! I better get busy!! What a great tag for a special person. I can hardly wait to make some....off to the store tomorrow!